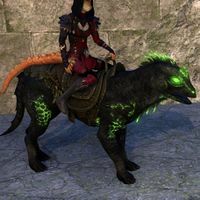 Venomous Wolf-Lizard is available from the Xanmeer Crown Crates as a Radiant Apex-level reward. Its default name is "Nightlight". Of all known Dwarven mounts, or vamidiums, one of the rarest is the Wolf animunculus with critical components made, not of Dwarven Metal, but of some sort of Dwemeri Glass. 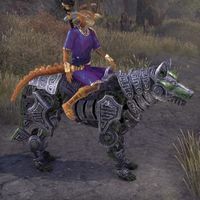 The Vitrine Dwarven Wolf is a Dwarven Automaton-themed mount, or "vamidium". It is available from the Crown Store via Dwarven Crown Crates as a hidden Apex-level reward. Its default name is "Gruffgears". This page was last modified on 4 February 2019, at 09:05.